“Is this really happening?” is just one of the many quotes or questions that may be asked when witnessing one of those obviously special sports moments. One of the more fun parts about being in the combat sports world is that there are separate sports that are similar enough for athletes to try their hands in the other aspects and varieties that exist outside of the one that they’re accustomed to. We’ve seen it before where top MMA fighters have gone over to other combat sports. Generally, it’s in or from boxing or kickboxing that mixed martial artists find themselves testing out and one of the most successful or notable cases earlier on may have been with Alistair Overeem. One of the lesser successful being James Toney’s attempt in MMA in 2010. That same year, the Dutchman Overeem would win one of the most prestigious striking tournaments in combat sports, the K-1 World Grand Prix. As amazing and big of an accomplishment as this was, it still lacked a certain magnitude of that “once in a lifetime” type of spectacle. 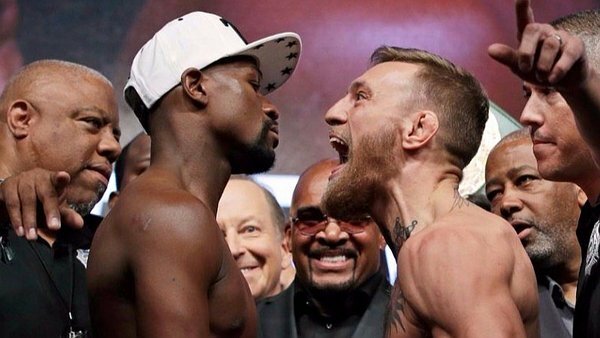 And in hindsight, whether we want to admit or not, the cross-sport boxing match between all-time great boxer Floyd Mayweather and the then UFC lightweight champion and former featherweight champion Conor McGregor was exactly that. Of course, the interest drawn from the match was across the world but the majority of it came from the USA where it was held in the heart of the fight capital of the world, Las Vegas, Nevada. The world in which we live is quite a big place though and recently on the complete other side of it, we got treated to another spectacle between Japan’s superstar kickboxing prodigy Tenshin Nasukawa and the continually evolving top MMA flyweight and bantamweight, Kyoji Horiguchi. If you’re disagreeing that Tenshin vs Horiguchi was a big deal, then I imagine that the 27,000 plus fans who sold out the Saitama Super Arena all while a natural disaster was taking place outside will have to disagree. These two fights really had some very interesting similarities. Each of the non-MMA fighters in Tenshin and Mayweather were undefeated superstars of their sports going in. For Tenshin, he was 31-0 while Mayweather was 49-0. Their opposition, the incredibly talented MMA fighters Horiguchi and McGregor were both making their respective debuts against two of the very best at their craft and were at the tops of their two MMA weight classes. As indicated by the sheer numbers and buzz generated, each fight was a money fight and spectacle that was massive for their countries and the sports involved. Despite a decent amount of differences, they still provide reasons for why Tenshin vs Horiguchi was Japan’s Mayweather vs McGregor. Perhaps even more so. Japan and America are two very different places after all. To start things off, Mayweather vs McGregor was in boxing and was coming out of retirement at the age of 40. As for Tenshin vs Horiguchi, it was a kickboxing match and a completely opposite type of experienced fighter compared to Mayweather as Tenshin was half of Mayweather’s age at just 20-years old. I would say that Tenshin is nowhere near retirement but if he can make enough money this early on and be satisfied with his already stellar career…then why not get out when you can? Sticking within the realm of the rulesets, Mayweather vs McGregor was contested for a “moneyweight” title that had the bout be spread over the course of 12 three minute rounds. Tenshin vs Horiguchi, on the other hand, was not for any title and only a three-minute three-round affair. On top of that, Tenshin vs Horiguchi was apart of a predominantly MMA-based event as RIZIN 13‘s headliner while Mayweather vs McGregor was exclusively boxing event. Now getting to the bigger differences. A lot of the spectacle portion of Mayweather vs McGregor was built on the hyping and lead up to the fight rather than the fight itself. In essence, it was completely and openly treated as a money fight with each fighter slandering the other to maximize the selling that was already expected to have very positive results regardless. Then we go to Tenshin vs Horiguchi. A fight that was also a money fight for the two, of course, but that was not even in the mind of anyone anticipating the fight. It was an entirely respectful lead up between the fighters and the excitement was accumulated by getting to see two incredibly skilled competitors meet. Then when they each did step into their rings, the results were the same but the fights were not. Regardless of his early success, McGregor wasn’t able to hang with Mayweather in his world and was slowly picked apart on route to a 10th round TKO for Mayweather. In Horiguchi’s attempt to do the unthinkable, he found much more success in a very entertaining and competitive bout with the prodigy, Tenshin. So much so that he was seemingly on his way to victory before a late flying wheel kick (of all things) from Tenshin changed the course of the fight by hurting Horiguchi which led to Tenshin pouring it on to steal the decision. In the end, these two fights just prove that there are multiple ways to successfully put on and build successful spectacle fights which are a very rare sight to see. Sure, a big difference here specifically just comes down to cultural. And that along with the other reasons still make Tenshin vs Horiguchi Japan’s version of Mayweather vs McGregor. Because…it’s Japan. And in a way, kind of a true or pure mixed martial arts type of way…it’s kind of better. But that’s an entirely different discussion for a different day.